In Victorian times, fresh flower selection was very limited, and people used particular assortments of flowers to convey specific messages. With the abundance of choice at your local florist in present day there are no rules - it is the sentiment that gives a bouquet of flowers its meaning. You may choose a favourite colour or flower that you know the receiver will love, or because it reminds you of them. 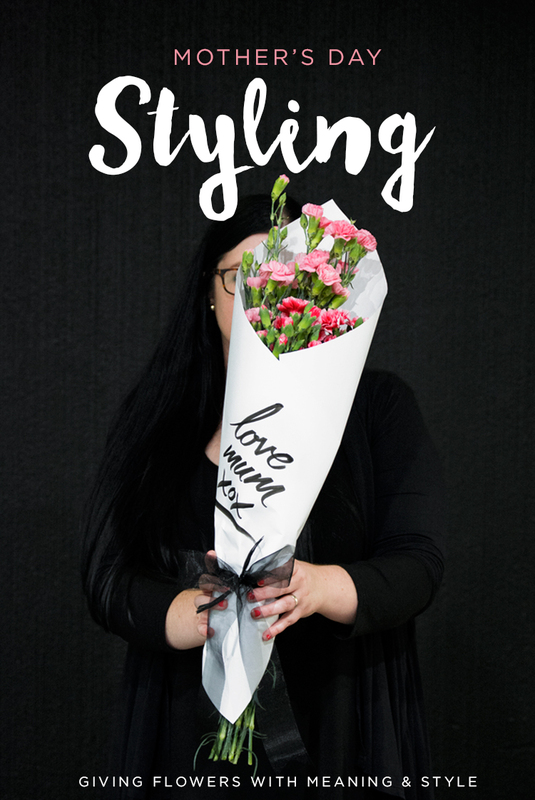 And nothing tells Mum how much you mean to her like a thoughtful bouquet, wrapped and hand delivered with a big smile and a warm hug. However, if you want to add an additional layer of meaning to your gift this Mother's Day, you can choose the following flowers for their traditional symbolism. 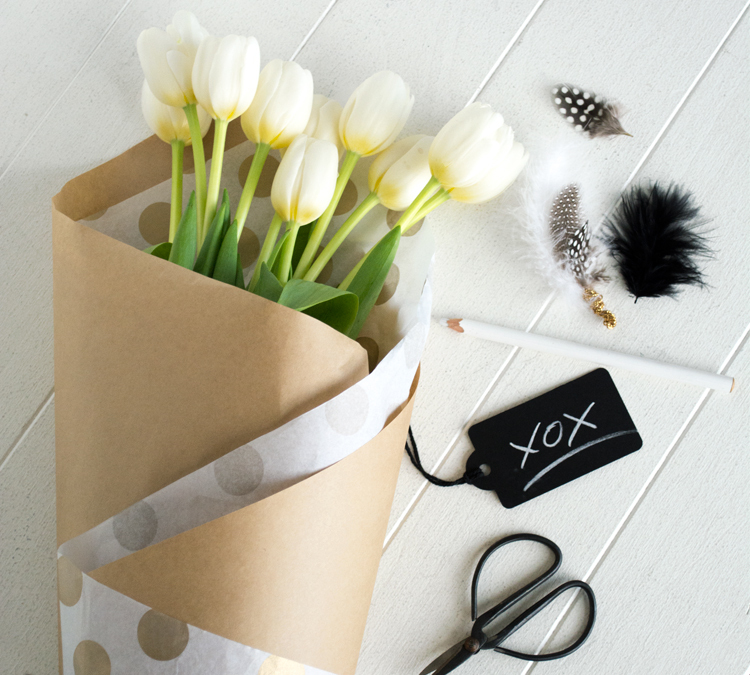 Create the look above with our Eco White Wrapping Paper and Black Dot Tissue. Personalise with a hand written note in black ink to mum. Carnations (above) - symbolise pride and beauty. A red carnation symbolises love, pride and admiration; a pink carnation symbolises the love of a woman or mother, which is why you see so many pink carnations around Mother's Day. Interestingly, yellow carnations symbolise distain, rejection or disappointment, whilst a white carnation symbolises innocence and pure love. Watch out for a striped carnation - it conveys refusal! Hydrangeas - symbolise heartfelt emotions. They can be used to express gratitude for being understood. If your Mum has helped you through tough times without judgement, this could be a great way of saying thanks. Mix Eco Mamata with Eco Black for a dramatic bouquet. Try creating a scallop edge to add extra interest. Lilies (above) - Lilies symbolise purity and refined beauty. White lilies symbolise modesty, yellow lilies represent gaiety whilst Lily of the Valley symbolises sweetness and purity of heart. A bouquet of white lilies will bloom and fill your Mum's home with a wonderful scent. Orchids - are a symbol of exotic beauty. An orchid symbolises refinement, thoughtfulness and mature charm. Did you know that an orchid also symbolises proud and glorious femininity? If your mum is an elegant woman with innate feminine strength, this could be the bouquet for her! Layer Brown Kraft and Gold Dot Tissue for a classic bouquet. Add accents of black and elements from nature, like feathers, for a more dramatic look. Tulips (above) - are a stunning flower that, quite simply, represent a declaration of love. It is commonly thought that tulips represent "perfect love" - like the kind of love between mothers and children, even when one party hasn't been behaving all that perfectly. The Classic Rose - represent love in its various forms. Did you know that 12 roses as a gift implies the ultimate declaration of love, 25 roses convey congratulations and 50 roses express unconditional love. Whatever the number, roses are a beautiful flower that will fill Mum's home with a heavenly scent. Yellow roses are symbols of friendship and caring (without the undertone of romance), whilst pink roses are used to convey gentle emotions such as admiration, joy and gratitude. 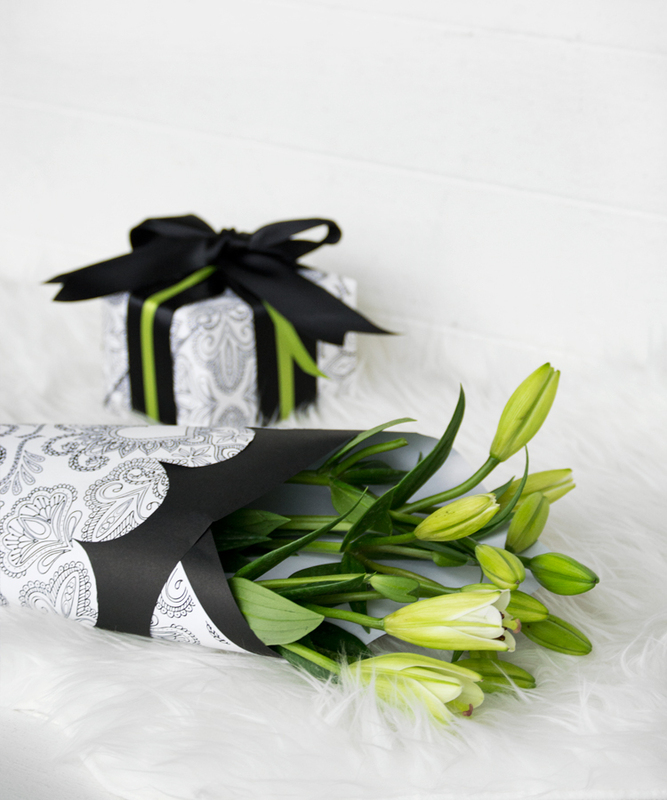 To make your bouquet even more special, wrap it in a beautiful gift wrapping paper like we have in the photos above. Using the cellophane provided with your bouquet will protect outer layers of paper from getting soggy (or, if you have handpicked your bouquet from the garden, a similar waterproof material such as a plastic bag will do). Cut a square sheet of wrapping paper from your roll and lie the paper on your surface so that it is on point (like a diamond rather than a square). Place your bouquet in the middle of your sheet of paper with the flowers pointed to the papers's top tip. Fold the paper over - from the bottom up first, and then from the left and right. Pull the paper together around the stems and then tie with thick ribbon or a piece of twin. Let your flowers guide the look of your wrap - rustic, elegant, vibrant or minimal. 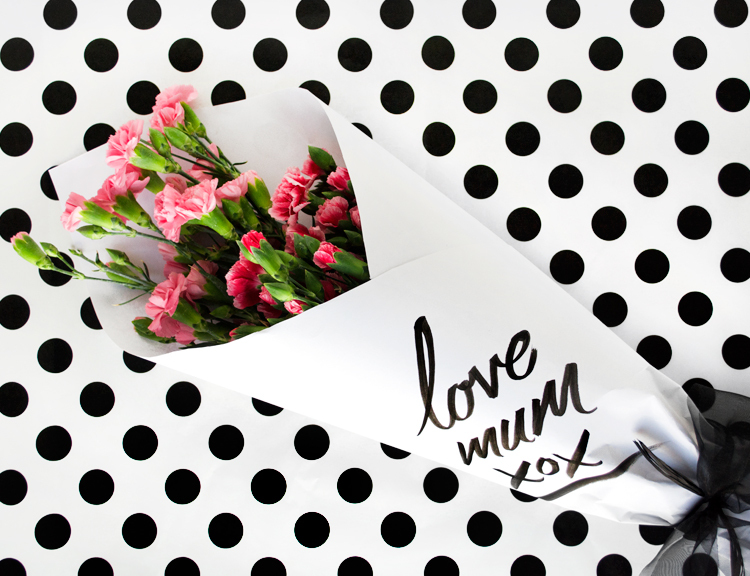 And don't forget to let your mum know in words as well as flowers that she means the world to you!